We are a non-profit Early Learning Program in Washington, DC. We provide an accredited, nurturing educational environment where children six weeks to five years old learn, grown and thrive. As early childhood educators, our first commitment is to children – helping them succeed in school and life. Our educators are committed to providing enriching and engaging educational experiences. We implement the Creative Curriculum, a comprehensive, research-based curriculum that encourages exploration and discovery as a way of developing confidence, creativity, and lifelong critical thinking skills. The Creative Curriculum is aligned with the Early Head Start Learning Outcomes Framework and DC Early Learning guidelines. It is designed to ensure your child is prepared for school success and meets targeted educational and developmental milestones. We foster deep family ties — in fact, nearly half of our families have been associated with the Early Learning Program for up to 10 years. We encourage parents to enroll siblings, and recommend us to other family members and friends. A nutritious breakfast, lunch and afternoon snack are included in the monthly tuition. The food is catered and approved by the United States Department of Agriculture. Interested in enrolling your child? Visit BoardofChildCare.org today to schedule your tour or to learn about our enrollment schedules, tuition and fees, and more. Board of Child Care’s programs are open to any individual regardless of their religious beliefs. There is no Spiritual life programing or instruction within the Early Learning Program. During the holidays any religion specific events (i.e. a visit from a bearded gentleman in a red suit) are optional and families are asked whether they would like their child to participate. Read more about BCC’s affiliation with the Untied Methodist Church. 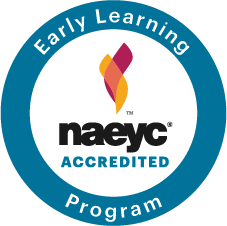 The Early Learning Program is NAEYC accredited! NAEYC is a national, voluntary accreditation system that sets professional standards for early childhood education programs. It serves to help families with children from birth through age eight identify high-quality programs. Board of Child Care is one of over 6,500 child care programs, preschools, early learning centers, and other center- or school-based early childhood education programs that are currently NAEYC-Accredited. Check out our blog post to see our most recent scorecard and learn more about our NAEYC accreditation.